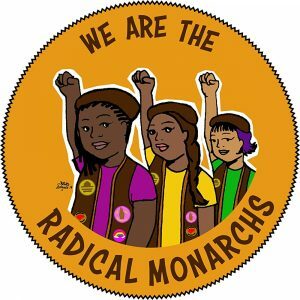 I met with director Linda Goldstein Knowlton on Sunday, March 10, 2019, at the 2019 SXSW Film Festival to discuss her inspiring documentary We Are the Radical Monarchs (which I also reviewed). 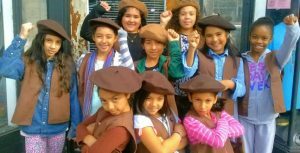 It’s a feature-length version of her 2017 short Radical Brownies (released online by The Guardian newspaper), following two energetic, passionate and extremely motivated women, Marilyn Hollinquest and Anayvette Martinez, as they create and manage a Brownie-like troop for young girls of color in Oakland, California, instilling in them not only self-pride and personal agency, but also a deep commitment to social justice and equality for all. Hollinquest and Martinez do amazing work, but it’s the girls who are the real stars, their intelligence and optimism given full reign by their mentors. The future looks bright, thanks to them. Here is a condensed digest of our conversation, edited for length and clarity. Hammer to Nail: Linda, I loved the short Radical Brownies. Did you always know that you wanted to adapt it into a feature or did that happen in the process? Linda Goldstein Knowlton: Well, actually it was always going be a feature, and I had already started making the feature when I met Charlie Phillips, of The Guardian, who has a piece of my heart. I love him. 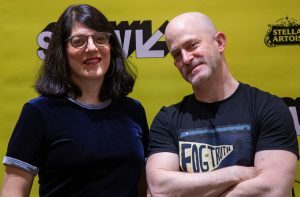 He found out about the feature from Grace Lee, our executive producer, and he was like, “Will you make a short?” And I’m like, “I’ve never made a short, and I’ve never made a short while making a feature. Yes, please. I would love to do that.” It was an incredible opportunity, and I learned a new skill about how to make a short film, and I’d never made anything for the web. HtN: That’s fascinating because often people make shorts as calling cards for features. Did having a short that was released on The Guardian’s webpage and their YouTube channel help you when looking for funding? Because it’s a relatively high-profile spot for your short. LGK: Oh, absolutely. Could not have asked for anything more high-profile. It was fantastic. It helped us in a lot of ways. The funding for the project has been a little slower than I had hoped, but it definitely helped and opened doors. It was fascinating also doing something for the web in this way where, initially, Charlie was getting everybody from The Guardian involved and how can we make it go wider, and not just viral, but how do we really reach out to different folks…not just preaching to the choir. They had their engagement people that are associated with their YouTube channel, and they’re like, “Yes. We want to do a live AMA,” and I’m like, “Great. I very much think that things will only change if we can actually have conversations with each other and actually listen to each other, and I would love that. However, I don’t know if you’ve looked at the comments on the trailer that y’all dropped. I’m not sure that this will be a productive and rational conversation.” They got back to me the next day. They were like, “Yeah. We think we’re not gonna do an AMA.” There’s just a lot of haters and racists, and people that are just so motivated by fear. HtN: Sure. Just look at what happened recently with the Rotten Tomatoes user comments before the release of Captain Marvel. The internet trolls were out in full force. So, may I just ask a stupid question? What is a “live AMA”? What does that stand for? HtN: It’s a live forum, basically. HtN: Got it. Thank you. One question I still have after watching both the short and the feature, and it might be in the short and I just don’t remember, is why “monarchs?” They started as Radical Brownies, and that makes sense that they were adapting a name that already existed, but did they then pick “monarchs” because of the idea of a butterfly emerging from a caterpillar? What motivated that name choice? quite fit. They originally called themselves the Radical Brownies because it’s such a great play on words, and it was fantastic. What we didn’t show in either the short or the feature, in that delightful Sean Hannity piece, was at the very end of his piece, he says, “So, I called the Girl Scouts of America to see if this is a real Brownie troop,” which they never said they were. They never represented themselves in that way. The Girl Scouts of America very politely sent them a letter and just said, “There’s too much confusion. We advise you to change your name.” And this is no shade on the Girl Scouts; there’s actually some amazing things going on with the Girl Scouts now. HtN: They just wanted to protect their brand. LGK: Exactly. It makes sense on a certain level. And actually, Anayvette and Marilyn, the co-founders, they were like, “Yeah, we do love this name, but we don’t want there to be confusion. We are who we are, and we want us to be unique.” They had the girls come together and throw out names, and they all voted on it. Monarchs is about, yes, coming out of a cocoon and blooming into something else. It’s also representation about integration. It just speaks to a lot of very beautiful things. Young girls becoming young women and all of that. HtN: That’s interesting. You just said that the girls voted on it. One of the things I really like about the Monarchs, and that I think you do a really good job of showing, is the pedagogy of Anayvette and Marilyn’s focus on getting the girls to do as much learning by actively and critically thinking as possible. I think it’s really wonderful, particularly when they’re interviewing the potential new teachers of troop #2. HtN: How did you assemble the crew for this particular film? LGK: Well, Katie Flint, who is my producing partner and editor, has worked with me for 15 years or so. She started actually as an assistant editor on my first documentary, The World According to Sesame Street. We just really connected, and she’s really talented. So, I’ve known her for a very long time. It’s been a really incredible partnership. Then, Grace Lee I met when we both directed and produced two different episodes of the Makers series, Women Who Change the World. That was a six-part series that was on PBS. Grace did Women in Politics, and I did Women in Hollywood. We got to know each other through that and became friends. She actually made the introduction to Charlie Phillips and is just a great sounding board. Suz Curtis, who’s associate producer, has been working with me on films since somewhere between Code Black and everything. She’s an incredible writer and just incredible make-everything-happen human. Guisel [Contreras] was brand new. This was her very first job out of film school, and she was our assistant editor, our assistant camera, our associate producer. She was our fairy god-person. Then, Claire [Major] also was new. She introduced us to Guisel. HtN: Claire was your DP [Director of Photography], right? HtN: How often did you film? Because the Radical Monarchs go through three-and-half years of their existence in the world of your film, but we don’t obviously see every single second. How often did you reconnect with them to film? LGK: It’s hard to say exactly because part of it was we wanted to be able to show how the group actually works, but if we had too many meetings, it would be a little too repetitive. I feel like we filmed once a month, maybe. Sometimes more than others. HtN: How often do they meet? Obviously, all these girls have families and lives beyond this. We only see them, however, for the most part, with the Monarchs. LGK: Correct. They meet basically twice a month, and then they have little breaks here and there around the holidays and summer and stuff like that. HtN: So, if you were filming once a month, you were catching a good portion of what they did. Were there any restrictions on access? I was impressed when you go to the State House in Sacramento, the access that the legislators that you met with gave you. Was there any time when you were stymied in being able to do what you wanted to do? LGK: A) I am very persistent, and B) we were really fortunate. We were able to film everything we wanted. HtN: Sure. Because it seems that other than that right-wing echo chamber, who would not want to support these girls? LGK: When you find out the answer, that would … yeah. HtN: But speaking of restrictions on access, it was interesting – not that I needed to know about Anayvette’s private life – but at one point we see this guy in the kitchen, at one point and that’s it. I’m just curious, was there a choice to just not include him at all, or did her partner not want to be filmed? HtN: Within the film, fundraising is a constant theme, and at the end we have this text about the Novo Foundation. How long is that funding for? HtN: They’re still good then, for now. LGK: They’re still good, but it’s a constant hustle. Even with the press they’ve received, and their accomplishments, it’s still really hard. There is this funding issue where, as Anayvette says in the film, even though they’re four years old now, that’s young to a lot of big foundations. Just like raising money for independent films where you have to hustle for $25,000 grants here and there, and that’s harder than actually making the film, they have to spend so much effort trying to … and it’s like, “Wait, we want to focus on the program and the girls and scaling and all of that.” It’s a frustration. It’s a constant. It’s good, though, that they’re doing it full-time, which was the first step of the dream. That’s fantastic. And they’re actually going to be starting four new troops. HtN: Excellent. That’s great! So, it’s fascinating to watch the girls in the course of your film get older. It’s always fascinating to watch people get older on camera. I particularly love Amia, the littlest one who then at the end is starting to grow in size, though her personality was always big. Have you thought, down the line, of revisiting these young women when they become adults, and seeing how much this might have had an impact on their future lives? LGK: Yeah, it’s funny because with Somewhere Between, in which I follow four teenage girls, I did originally want to do kind of a 7 Up idea. I went to Michael Apted, whom I know, and I said, “Here’s my idea. There is this group of girls inspired by my daughter. Can I rip you off? I would do it every eight years, because eight is lucky in China.” And he’s like, “Go with God. Have a nice time. But let me just remind you of one thing, which is that 7 Up started as a one-off. What’s your central question? If you end up following them every eight years, icing on the cake. But what are you really looking at?” That was the best advice ever. People have come to me about that film, too, and said, “Are you going to go back?” For that film, if they want to explore how they are as adults, I want them to do it. It’s their story to tell. With this … first of all, we’re all going to be either working for Amia, or she’s going to be president, or both. That’s how I feel about Amia. Yeah, I would love to go back and see how this has influenced their lives, and how the scaling of the movement is going and all that. HtN: Maybe Amia can use some of this footage for her campaign videos. HtN: Well Linda, congratulations on the film. I really enjoyed it. LGK: Thank you so much.